The U.S. Capitol could boil with pitched political battles over the environment for the next two years after Democrats captured control of the House in yesterday's midterm elections but missed seizing the Senate. Republicans held on to their Senate majority in part by knocking off coal-country Democrats in states such as Indiana and North Dakota, both of which President Trump carried by large margins in 2016. Democrats' path to victory in the House often ran through suburban districts that Hillary Clinton won two years ago. 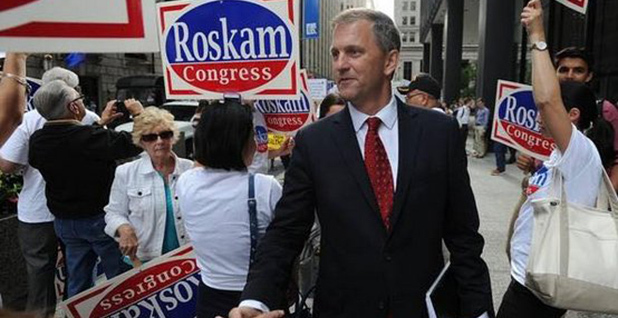 Among them is Democrat Sean Casten, who toppled six-term Republican Rep. Peter Roskam on the outskirts of Chicagoland. E&E News features, analysis and updates on the midterm elections. Click here to view the stories and interactive map. Casten made climate change a central plank of his platform, even dedicating his Twitter bio to that issue. It says that "after years fighting climate change as an entrepreneur," Casten is "determined to fight it as the next member of Congress" from Illinois' 6th District. The Democratic takeover in the House promises to roil the final two years of President Trump's turbulent term. But the party's victories might also come with a cost for those seeking bipartisan solutions to global warming. Republican losses include House incumbents who were at least amendable to talking about climate change. Others were trying to address it. Among them was Rep. Carlos Curbelo, a Republican from South Florida who co-founded the Climate Solutions Caucus and recently introduced legislation to put a tax on carbon emissions. He was ousted by Democrat Debbie Mucarsel-Powell, who argued on the campaign trail that a Democratic-controlled House would be more willing to directly confront global warming. "Together we will work for a country where we finally take action to fight climate change," she said in a statement following her victory. Yet even as Democrats made gains in some House races, they fell short in other contests in which environmental issues played a role. In another Florida battle, Democrat Andrew Gillum lost a bruising race for governor to Republican Ron DeSantis. Gillum was backed heavily by billionaire environmentalist Tom Steyer, and Gillum said he wanted to make Florida a leader in renewable energy — especially solar. DeSantis squeezed out a victory that might have been buoyed by his attacks on the state's sugar industry for its role in polluting Florida's waterways. His win came in spite of his skepticism toward humanity's contribution to global warming in a state that is already fighting the effects of a warmer planet. "Even though climate concerns and clean energy concerns were front of mind for voters ... that just didn't seem to be enough to overcome entrenched partisanship," said Aliki Moncrief, executive director of Florida Conservation Voters. Tuesday's results follow a tumultuous two years of climate politics, some of which fed into Democratic enthusiasm in congressional races nationwide. Notable was the October release of an alarming U.N. report warning world leaders that they need to get global warming under control in a few short years or face a future plagued by food shortages and coastal flooding. Candidates in more than a dozen Senate or gubernatorial races were asked about climate change in debates leading up to Election Day, and several Democratic candidates jumped on the U.N. findings as evidence that U.S. policymakers must take immediate action. The findings from the Intergovernmental Panel on Climate Change "should be a wake-up call for all of us to take climate change seriously," wrote Democrat Elaine Luria in a Twitter post last month. Luria defeated Rep. Scott Taylor (R-Va.) in a coastal Virginia district that is experiencing rising sea levels. Taylor acknowledged the presence of climate change but agreed with Trump's decision to withdraw from the Paris climate accord, saying the move would protect the "American taxpayer from sending billions of dollars overseas." A possible factor in the Democratic takeover of the House was an uptick in spending by environmental groups. The League of Conservation Voters boasted last week that it had directed more than $80 million — through spending and fundraising — toward the midterm election, a record for the group. Taylor was one target. So was Rep. Mike Coffman, a Republican in a suburban district of Denver. He lost to Democratic challenger Jason Crow and was one of about a dozen Republican members of the Climate Solutions Caucus who were defeated Tuesday alongside Curbelo, the group's co-founder. Rep. Brian Fitzpatrick (R-Pa.) is another member of the Climate Solutions Caucus, but unlike Coffman, he has voted in line with environmentalists most of the time. He had the highest green rating among House Republicans last year, according to the League of Conservation Voters. It might have helped him win. The LCV didn't endorse Fitzpatrick's Democratic opponent, Scott Wallace, and Fitzpatrick edged out a victory. "In a tough midterm election, tonight brought mixed results for Republican candidates across the country," said James Dozier, executive director of Citizens for Responsible Energy Solutions, a group that advocates for clean energy policy on the right. He added that Curbelo's loss was "certainly disappointing" but said lawmakers such as Fitzpatrick could pick up the banner. "Looking ahead to 2020 and beyond, more Republicans must proactively embrace pragmatic clean energy policies that sustain economic growth, strengthen our national security and proactively address the real challenges that result from climate change," Dozier said. In capturing the House, Democrats almost certainly will change the tenor of how Capitol Hill talks about climate change — if nothing else. There's little chance in the next two years that Congress and the White House will agree to an ambitious climate bill with Trump in the White House, Republicans in control of the Senate and both parties primed for a fight ahead of the 2020 election. But House Democrats could be a thorn in the side of Republicans by forcing votes on measures to combat global warming. They'll also have control of committee chairmanships, giving Democrats the power to drill into the White House and agencies such as EPA and the Interior Department. Rep. Gerry Connolly (D-Va.), who sits on the House Oversight and Government Reform Committee, told E&E News last week that he expects "very aggressive oversight" (Greenwire, Oct. 31). Trump repeatedly dismissed warnings about climate change leading up to the election. In response to the U.N. report, he questioned the motivations of the scientists behind it. "I want to look at who drew it. You know, which group drew it," Trump said. "Because I can give you reports that are fabulous, and I can give you reports that aren't so good." Two years into his presidency, Trump has rolled back or weakened a host of climate initiatives. One of the first and biggest steps was his decision in June 2017 to withdraw the United States from the landmark climate accord that sought to bring the world's nations together with the shared goal of keeping climate change to a minimum. The Trump administration also froze Obama-era plans to gradually increase fuel efficiency standards for cars in the 2020s. And it's rolling back the Clean Power Plan, which sought to reduce greenhouse gas emissions at power plants (Climatewire, Oct. 2). Trump promoted Republican Patrick Morrisey, who failed yesterday to unseat Democratic Sen. Joe Manchin of West Virginia. As the state's attorney general, Morrisey tried to block the Clean Power Plan in court — a move that earned him the support of the West Virginia Coal Association. Manchin — who has a 45 percent career rating with the League of Conservation Voters — opposed the Clean Power Plan, as well, once describing it as an "assault on our state's economy and our way of life." He did better Tuesday than two other coal-country Democrats running for re-election. Democratic Sen. Joe Donnelly of Indiana couldn't keep his seat against Republican Mike Braun. Donnelly was one of a handful of Senate Democrats to vote against the Clean Power Plan, but his effort to strike a more conservative tone wasn't enough to convince voters in a state that sent Vice President Mike Pence to Washington alongside Trump. North Dakota Sen. Heidi Heitkamp (D) also lost — in spite of her own opposition to the Clean Power Plan. The winner in the state's Senate race was Rep. Kevin Cramer (R). "Thank you North Dakota," Cramer wrote on Twitter after the win. "Representing you in the United States Senate will be the honor of a lifetime."